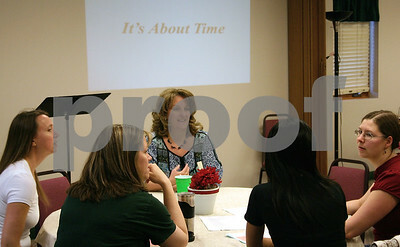 Jeff Engelhardt – jengelhardt@shawmedia.com Rhonda O'Brien (center) talks with some of the women at the Moms Connected event on May 10 at the Evangelical Free Church of Sycamore-DeKalb. O'Brien was one of nine guest speakers the group brought in during the year. 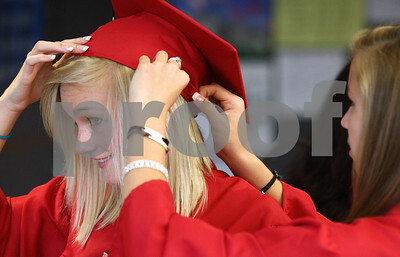 Kyle Bursaw – kbursaw@shawmedia.com Ally Bretzing helps fellow Indian Creek senior Megan Govig adjust her cap before the graduation ceremony at their high school on Sunday, May 13, 2012. 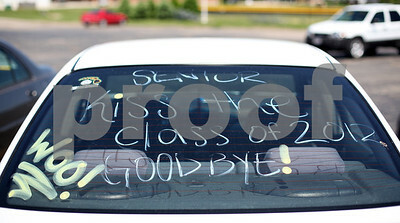 Kyle Bursaw – kbursaw@shawmedia.com A car in the parking lot of Indian Creek High School reads "kiss the class of 2012 goodbye!" 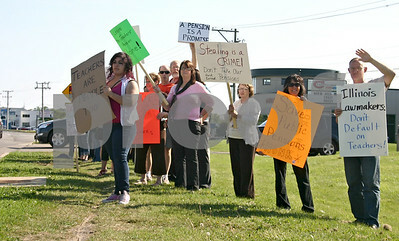 on Sunday, May 13, 2012. 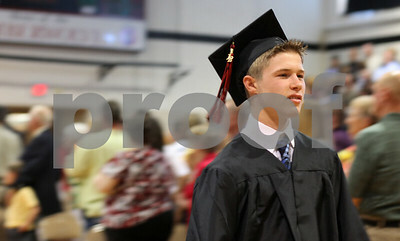 Kyle Bursaw – kbursaw@shawmedia.com Caleb Gaston makes his way up Indian Creek High School's gymnasium to his seat for the graduation ceremony on Sunday, May 13, 2012. 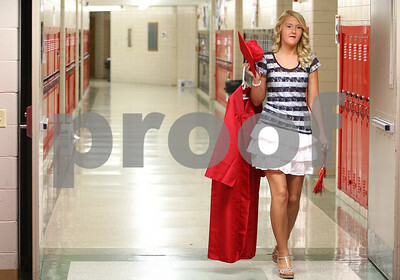 Kyle Bursaw – kbursaw@shawmedia.com Kim Spickerman makes her way through the hallway at Indian Creek High School to get ready with the rest of the graduating seniors in the library before the ceremony on Sunday, May 13, 2012. 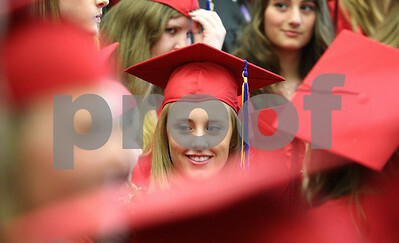 Kyle Bursaw – kbursaw@shawmedia.com Kalia Foster cracks a smile while talking to a classmate the Indian Creek seniors wait to take a class picture before the graduation ceremony at their high school on Sunday, May 13, 2012. 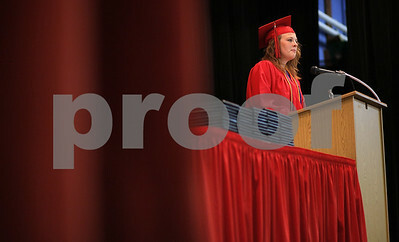 Kyle Bursaw – kbursaw@shawmedia.com Valedictorian Sara Sanderson addresses the Indian Creek class of 2012 during their graduation ceremony at Indian Creek High School on Sunday, May 13, 2012. Kyle Bursaw – kbursaw@shawmedia.com Seniors Shaquille Crayton (left) and Jared Landsteiner stay cool by an open door to their school library as the wait for the graduation ceremony to start on Sunday, May 13, 2012. 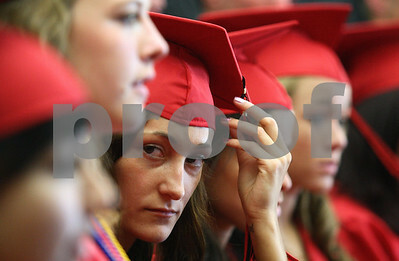 Kyle Bursaw – kbursaw@shawmedia.com Salutatorian Jessica Shroka adjusts her tassel before taking a group picture with her fellow Indian Creek seniors before their graduation ceremony on Sunday, May 13, 2012. 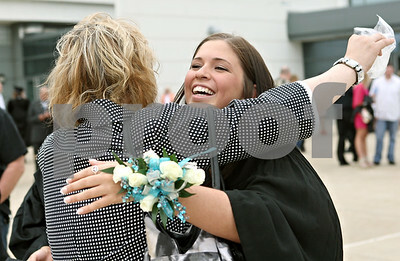 Rob Winner – rwinner@shawmedia.com Kristin Altenhoff (right) is hugged by her aunt Karen Daudelin before entering the Convocation Center in DeKalb for the second of three Northern Illinois University undergraduate ceremonies Saturday, May 12, 2012. 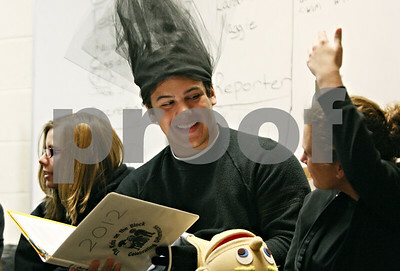 Altenhoff majored in marketing. 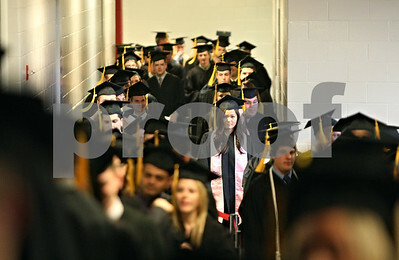 Rob Winner – rwinner@shawmedia.com Northern Illinois University graduating seniors make their trek from Victor E. Court to the floor of the Convocation Center in DeKalb for the second of three undergraduate commencements on Saturday. 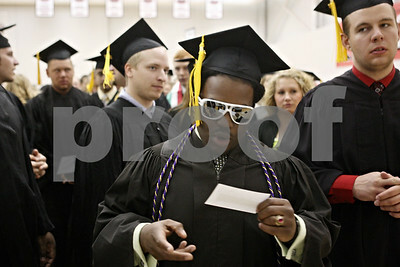 Rob Winner – rwinner@shawmedia.com Finance major Rod Speech checks in within Victor E. Court before the start of the Northern Illinois University undergraduate commencement at the Convocation Center in DeKalb Saturday, May 12, 2012. Rob Winner – rwinner@shawmedia.com Luiza Aleksiejczyk, a business and marketing major, quickly makes her way down a set of stairs to Victor E. Court as the Northern Illinois University 2012 undergraduate class begins to line up to head inside the Convocation Center for commencement in DeKalb Saturday. 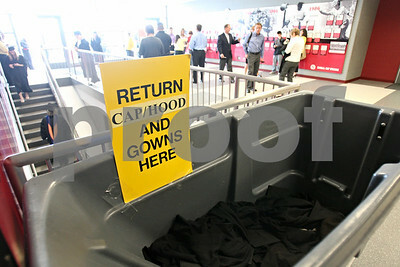 Rob Winner – rwinner@shawmedia.com Dumpsters used to collect cap and gowns were placed strategically around the Convocation Center in DeKalb for Saturday's ceremonies. 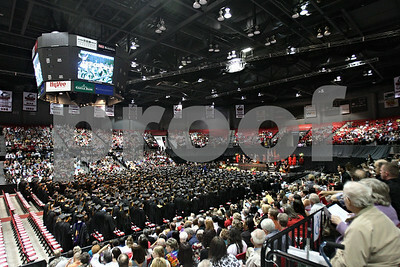 Rob Winner – rwinner@shawmedia.com Northern Illinois University graduates and their families fill the Convocation Center in DeKalb Saturday afternoon. 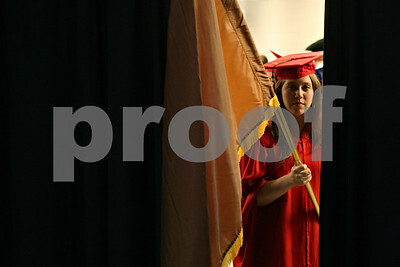 Rob Winner – rwinner@shawmedia.com Northern Illinois University graduating senior Kate Booth peers out into the Convocation Center before the start of the second of three commencements in DeKalb Saturday afternoon. 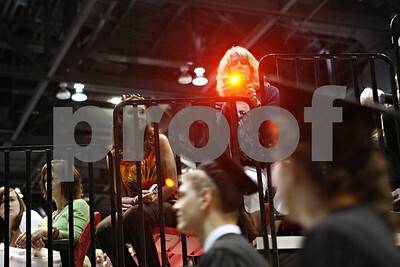 Rob Winner – rwinner@shawmedia.com A proud parent captures an image of her son as undergraduate seniors make their way onto the Convocation Center's floor in DeKalb Saturday. 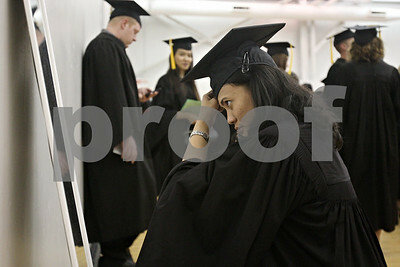 Rob Winner – rwinner@shawmedia.com Accounting major Fransiska Gultom uses a mirror to prepare for the second of three commencements at the Convocation Center in DeKalb Saturday. 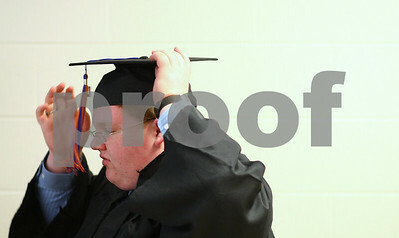 Rob Winner – rwinner@shawmedia.com Mechanical engineering major Haitham Felemban adjusts his cap before the second of three undergraduate ceremonies at the Convocation Center in DeKalb Saturday, May 12, 2012. Rob Winner – rwinner@shawmedia.com Navy GSE3(SW) Justin Cano of DeKalb kisses his girlfriend, Kayla Bishop, as she holds her son, Drake Bishop, 8-months-old, upon arrival at Sullivan's Tavern Saturday for a welcome home celebration. 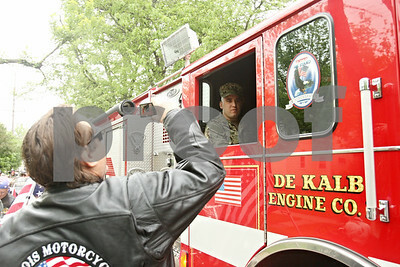 Cano was escorted by a DeKalb fire engine followed by a group Warriors' Watch Riders, family and friends. 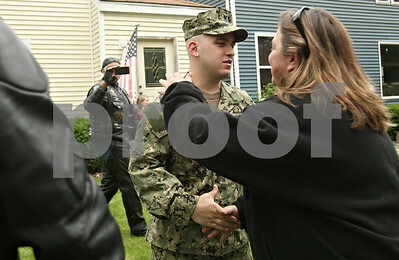 Rob Winner – rwinner@shawmedia.com Navy GSE3(SW) Justin Cano is greeted by a group Warriors' Watch Riders in front of his family's DeKalb home on Saturday afternoon. Rob Winner – rwinner@shawmedia.com Navy GSE3(SW) Justin Cano is hugged by his 5-year-old cousin Yesenia Aspera outside of Sullivan's Tavern in DeKalb before a welcome home celebration Saturday. Rob Winner – rwinner@shawmedia.com Navy GSE3(SW) Justin Cano of DeKalb sits inside a DeKalb fire engine before being escorted to Sullivan's Tavern in DeKalb for a welcome home celebration Saturday. The engine was followed by a group of Warriors' Watch Riders, family and friends. Rob Winner – rwinner@shawmedia.com Sycamore High School students Matt Copple and Sara Atkins (right) talk quietly back stage as Copple waits for his cue while holding a puppet during an educational program for fourth graders at Southeast Elementary School called "The Kids on the Block," Tuesday afternoon. 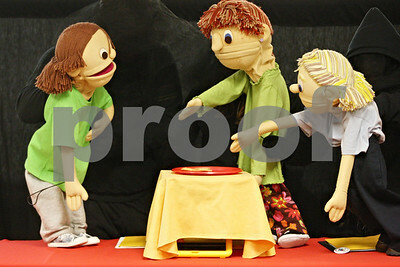 Rob Winner – rwinner@shawmedia.com Puppets are used during an educational program for fourth graders at Southeast Elementary School called "The Kids on the Block," Tuesday afternoon. Students from Sycamore High and Middle School controlled the puppets as they taught the elementary school children about autism and down syndrome. 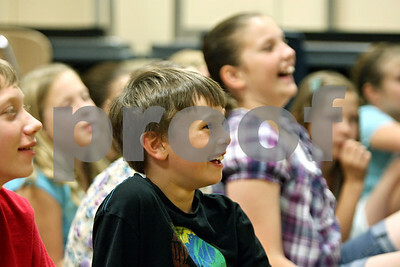 Rob Winner – rwinner@shawmedia.com Fourth grade student John Needham, 10, laughs during an educational program at Southeast Elementary School called "The Kids on the Block," Tuesday afternoon. 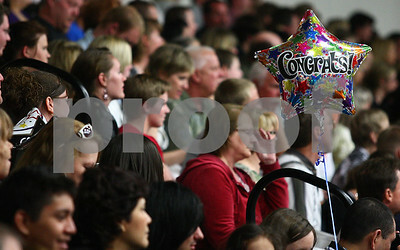 Kyle Bursaw – kbursaw@shawmedia.com A member of the audience at the Genoa-Kingston High School graduation has a congratulatory balloon during the ceremony on Wednesday, May 16, 2012. 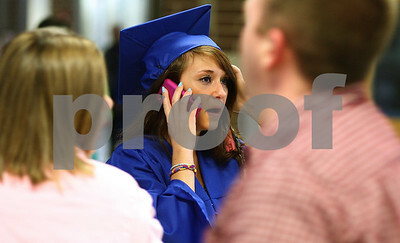 Kyle Bursaw – kbursaw@shawmedia.com Stephanie Covington calls her mother to try and find her before the Genoa-Kingston graduation ceremony on Wednesday, May 16, 2012. 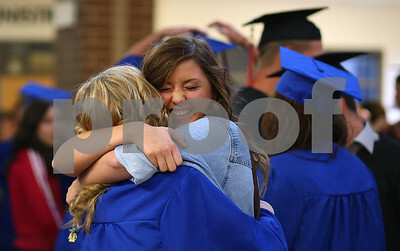 Kyle Bursaw – kbursaw@shawmedia.com Genoa-Kingston junior Daphne Vassmer gives graduating senior Danielle Stensrud a hug that knocks her cap right off of her head before the ceremony on Wednesday, May 16, 2012. 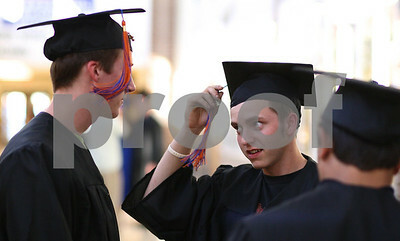 Kyle Bursaw – kbursaw@shawmedia.com Zachary Zuberbier (face to camera) adjusts his tassel while chatting with his fellow graduating seniors before the Genoa-Kingston graduation ceremony on Wednesday, May 16, 2012. 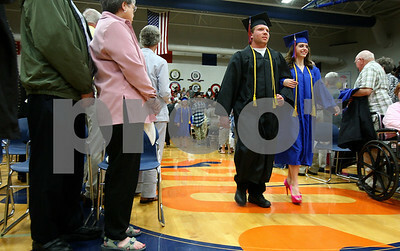 Kyle Bursaw – kbursaw@shawmedia.com David Garza and Danielle Stensrud make their way to their seats during the Genoa-Kingston graduation ceremony on Wednesday, May 16, 2012. 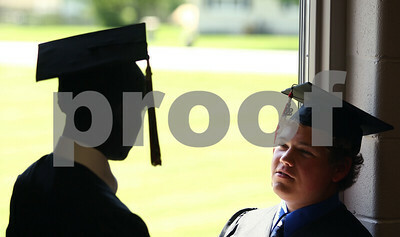 Kyle Bursaw – kbursaw@shawmedia.com Genoa-Kingston graduating senior Paul VanDerHeyden adjusts his cap in the hallway before the ceremony on Wednesday, May 16, 2012. 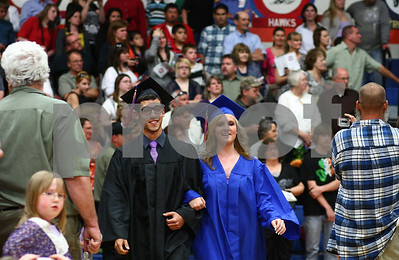 Kyle Bursaw – kbursaw@shawmedia.com Two of Genoa-Kingston's graduating seniors make their way to their seats during the ceremony on Wednesday, May 16, 2012. 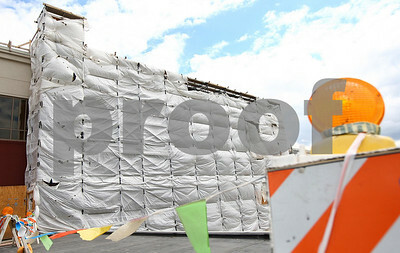 Kyle Bursaw – kbursaw@shawmedia.com A view of the construction at Kishwaukee Community Hospital on Wednesday, May 9, 2012. Kyle Bursaw – kbursaw@shawmedia.com Mark Flood, of Mr. David's Carpet, measures some linoleum to be cut for a room on the second floor of the expansion to Kishwaukee Community Hospital on Wednesday, May 9, 2012. Kyle Bursaw – kbursaw@shawmedia.com Mike Lafferty of All American Roofing gathers up his supplies after finishing a water proofing treatment on part of the expansion at Kishwaukee Community Hospital on Wednesday, May 9, 2012. Kyle Bursaw – kbursaw@shawmedia.com Mawahib Osman uses pictures of nine-month-old Ali Ali on her cell phone to try to calm him down while he has blood drawn at the Community Cares Clinic on Thursday, May 10, 2012. Kyle Bursaw – kbursaw@shawmedia.com Pete Polarek has been named the new chief of the Sycamore Fire Department. 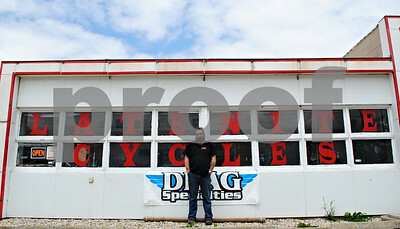 Taken Thursday, May 17, 2012. Kyle Bursaw – kbursaw@shawmedia.com Terry Scott Jr. (left) and his fiancee Leah Buffenbarger look on as Elvia Hamm (center), a certified medical assistant, takes four-year-old Mariah Scott's blood pressure as her brother Terry Scott III waits for his turn in the Community Cares Clinic on Thursday, May 10, 2012. 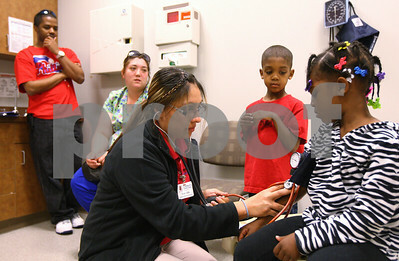 The two children were getting routine checkups to be cleared for the upcoming school year. Kyle Bursaw – kbursaw@shawmedia.com Phlebotomist Priscilla Clampitt (center) attempts to get a blood sample from nine-month-old Ali Ali as he is restrained by his parents Mawahib Osman (left) and Abuobaida Mohamed (right) and clinic employee Amy Berger at the Community Cares Clinic on Thursday, May 10, 2012. 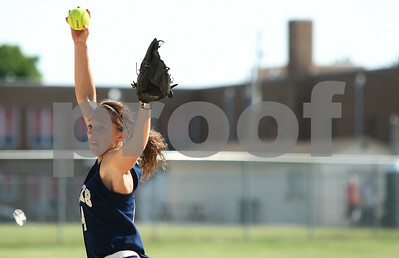 Kyle Bursaw – kbursaw@shawmedia.com Dani Clark delivers a pitch to a LaMoille batter on her way to a no-hitter. 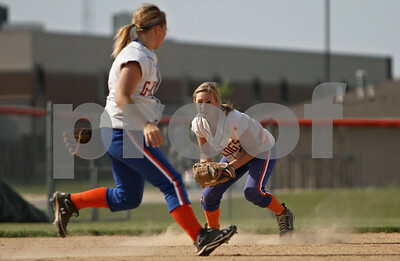 Hiawatha won 9-0 in Kirkland, Ill. on Monday, May 14, 2012. 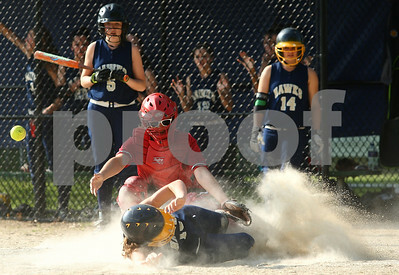 Kyle Bursaw – kbursaw@shawmedia.com Haley Melendez slides safely into home plate for one of Hiawatha's nine runs as LaMoille catcher Erika Walzer can't hang onto the ball. 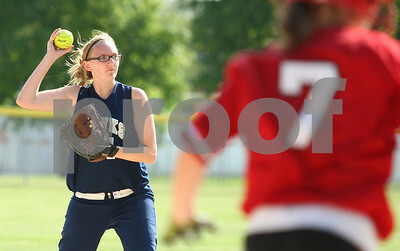 Hiawatha defeated LaMoille 9-0 in Kirkland, Ill. on Monday, May 14, 2012. Rob Winner – rwinner@shawmedia.com Genoa-Kingston pitcher Danielle Engle begins her wind up as Woodlands Academy batter Maggie Hambleton awaits the pitch in the first inning of a Class 2A GK Regional semifinal Tuesday afternoon. GK defeated Woodlands Academy, 11-0, in five innings. Kyle Bursaw – kbursaw@shawmedia.com Mackenzie Adamson throws to first to try get out LaMoille batter Ragen Forbes during Hiawatha's 9-0 win over LaMoille in Kirkland, Ill. on Monday, May 14, 2012. 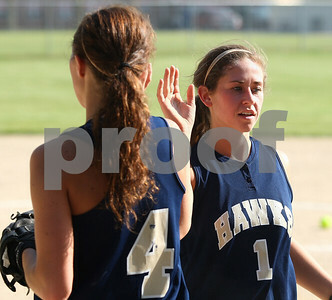 Kyle Bursaw – kbursaw@shawmedia.com Dani Clark (4) and Ashley Tamraz (1) high five after finishing the top of an inning against LaMoille. 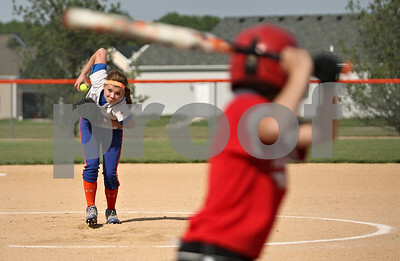 Hiawatha defeated LaMoille 9-0 in Kirkland, Ill. on Monday, May 14, 2012. Rob Winner – rwinner@shawmedia.com Genoa-Kingston third baseman Amy Clark (left) backs off as shortstop Natalie Klein fields a ground ball before throwing to first for the second out of the top of the second inning during a Class 2A GK Regional semifinal Tuesday afternoon. GK defeated Woodlands Academy, 11-0, in five innings. 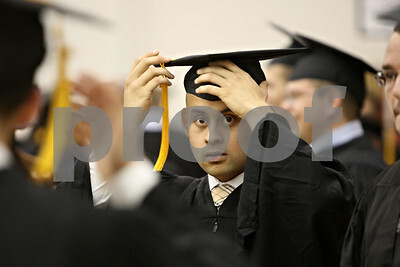 Mechanical engineering major Haitham Felemban adjusts his cap before the second of three undergraduate ceremonies at the Convocation Center in DeKalb Saturday, May 12, 2012.